Answering these questions will let you identify what you need from an email newsletter provider–which, in turn, will help you choose the best service to suit your needs. Wait, I see someone’s hand waving in the back of the Internet. What’s that? Why use an email newsletter service? Why not just send out emails on your own? you need to know the rules. 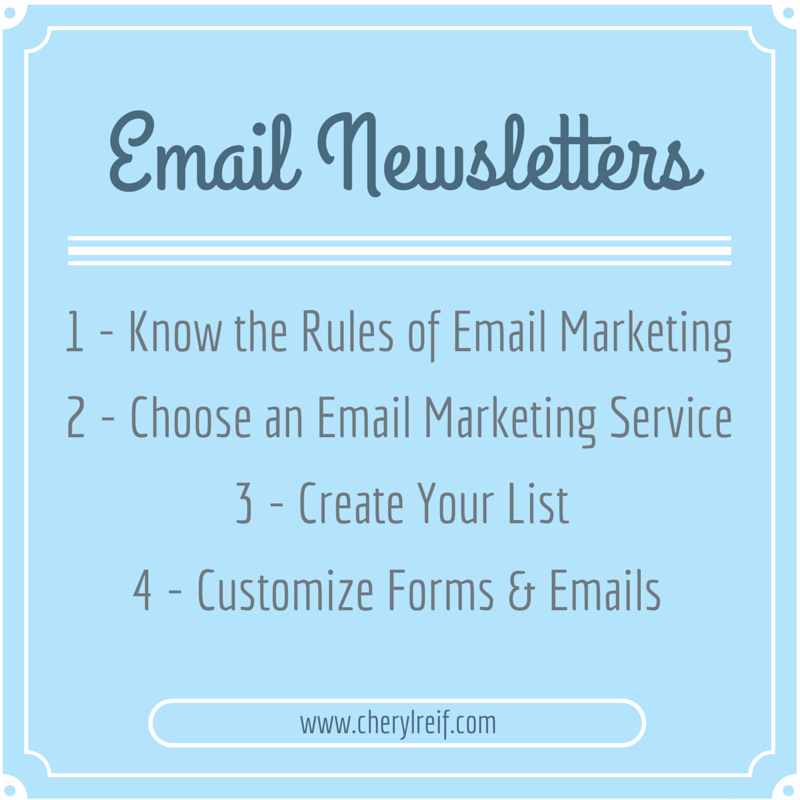 That’s why “step 1” of setting up your author newsletter is knowing the rules of email marketing. Get consent before you add anyone to your email list. It’s the law. Your email list subscribers need to “opt in” to receiving your messages. Your email messages should have a visible link for readers to unsubscribe. Be honest & accurate about who you are and why you’re emailing. Any messages you send to list subscribers need to include a physical business address and a real email address in the email’s “from” field. It’s also a good idea to include a note about where subscribers signed up for your newsletter. Getting back to that question about why to use an email newsletter service–the reputable services will help you make sure you follow these rules. If you don’t, there’s a good chance that sending bulk emails from your personal email address will get you blacklisted as a spammer. AND from the gremlins patrolling your local fiber optic cables. Seriously. You don’t want that! Now that we’ve got the rules out of the way, you’re ready to choose an email newsletter service provider. Which one is best? The answer depends on what features are most important to you. Here are some key things you’ll want to consider. On a scale of 1 to 5, where 1 is “What do you mean, you have plug the whoseit into the whatsit?” and 5 is “No problem, I’ll just redo the CSS and debug that code while I’m at it,” how tech-savvy are you? You might do best with a service that provides the simplest possible solutions. Check out TinyLetter. TinyLetter is an email newsletter solution that’s totally free, simple to set up, and easy to use. It has absolutely no bells and whistles–which is perfect for some situations. I think MailChimp falls more in the middle of the ease-of-use spectrum. It has numerous “plug-and-play” templates available, where you simply choose a look and layout and start typing. If you want to add your own branding or design your own layout, it supports those options as well. MailChimp has a great series of how-to videos and articles to help you set up templates and forms. I’ve been very happy with MailChimp and I know of several respected authors/bloggers who also use this service (eg, Jane Friedman) but I have seen several reviews complaining about poor customer service and lack of technical support. For a free option, though, it’s a great product. If you’re confident in your ability to overcome tech hurdles, consider yourself unlimited in your choice of email newsletter service providers! Some services (such as AWeber, recommended by author platform guru Katie Davis) offer much greater automation and other functionality in exchange for a bit more up-front learning time. Although all the email services I checked out offered a free trial for potential users, not all offer a free plan beyond the trial period. If you want to stick to a free plan for the foreseeable future, check out MailChimp and TinyLetter. Just keep in mind that you don’t always get full functionality with the free version of these services. Will your forms and emails include your provider’s logo or branding? Do you want to use your own “branding”–that is, do you want the ability to choose color combinations, select specific fonts, and upload images or logos? How much control do you want over your newsletter’s final appearance? Many authors automate some or all of their email messages. An autoresponder allows you to create a specific sequence of messages that will go to each subscriber starting when he or she signs up. These messages contain evergreen content, information that retains its value over time. Some authors deliver a mini-course to subscribers using this type of automation, as an incentive to sign up. If you want to use automation, you’ll need to pay for the service–but it’s not something you need to set up right away. Most services offer some type of tracking and analytics. (TinyMail is one exception.) However, the types and depth of tracking/analytics depends on the specific provider. If you don’t worry too much about analytics, then any of the providers mentioned will probably give you enough information to give you a general idea of who’s receiving your emails, how many people open them, and how many click on links. If you’re interested in more in-depth analytics, you’ll want to take a closer look at the bells and whistles different services provide. If you’re just starting your email newsletter, it may be tempting to go with the simplest, least expensive platform out there. Remember, though: Your goal is to grow your subscriber list. You want to choose a provider that can accommodate your growth and provide additional features and functionality as you need them. Across the web, I’ve read numerous reports that it’s a HUGE pain to switch providers after you’ve gotten started. Is it really that big a deal? I’m not sure. I’ve experimented with exporting and re-importing my current subscriber list, in an attempt to answer that very question. It didn’t seem that difficult to me, but then, I’m not using any automation or list segmentation or any of the other fancy things one can do with email lists. Before you can start signing up subscribers, you need something they’ll sign up to. 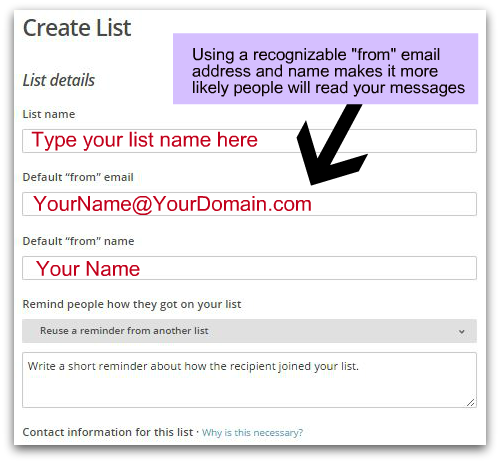 In email newsletter terms, this means you’ll create a list. You can only create signup forms and start adding subscribers to your list after going through this initial list setup process. The specific forms available, their names, and the degree to which you can customize them will depend on the specific email newsletter service provider you choose. These are a subset of the forms and pages that you can use and customize using a free MailChimp account, but you’ll find most of these options no matter which service you use. It’s important to take time to customize these forms. They give you a valuable opportunity to connect with your most valuable readers–those who care enough about what you have to say that they’re willing to share their email with you. So take an afternoon and spruce up those forms–give them your style, your voice, and a brief message to let subscribers know what you’re about. Encourage readers to sign up by letting them know what signup means–how often you’ll contact them, what sort of information you plan to share, etc. The more information you ask for in the signup form, the greater the resistance users will feel as they fill out the form–and the greater the chance that they’ll quit midway through the signup process. In layman’s terms: Keep it simple and ask for the bare minimum amount of info! Continue to let subscribers know what to expect by adding a bit of personalized copy here. Consider reminding subscribers where they signed up for your email list. This serves to jog the reader’s memory if she doesn’t immediately recognize the “from” address or newsletter name. Be friendly! Say thank you! After all, subscribers just entrusted you with a valuable asset (their email address) and they want to know that you’re a real person who won’t abuse it. Are you offering subscribers some sort of incentive to sign up? You can include a link on this page so they can go to it directly. I use this message to send a link to subscribers’ opt-in reward directly to them. Phew! That was a lot of info to cover in a single post. Believe it or not, I have even more info, in the form of a resource list and how-to checklist. They’ll be ready tomorrow–but available only to newsletter subscribers. Sign up now to get on my list!